Chris Froome has now won all the Grand Tours, the epitomes of road cycling. Not only that, but he has won them consecutively- a feat only the defined legends of Bernard Hinault and Eddy Merckx have ever accomplished. We see them as true greats, so in comparison, why is Froome so uncelebrated? Having won both the Tour de France 4 times (2013, 2015, 2016, 2017), Vuelta a Espana (2017) once and now Giro d’Italia (2018) he is arguably the most prolific cyclist of the modern era- one with exceptional talent, skill, and perseverance. His recent Giro d’Italia performance on Stage 19, a superb 80km solo ride into the finish, propelling him from fourth- 3 minutes 22 seconds off the pace- into a comfortable 40 second lead with only one racing day left, proves how he can provide breath-taking entertainment. He has moved from the monotonous, safe riding seen in the early years of Team Sky, which was understandably disliked around the cycling community for its predictability, to a much more risk-taking and exciting style of the sport. Just look at his descending technique in the 2016 Tour de France, where he crouched on his top-tube at ridiculous speeds for a mere 13 seconds gain. While you could argue his style still isn’t the most exciting or attractive in road cycling history, he hasn’t lacked thrilling moments, especially for a General Classification rider. Despite his performances, most Brits following the 2018 Giro feel hard done by, regardless that a British rider won. Simon Yates, who led for 13 stages with 4 stage wins, was so close to winning his first ever Grand Tour, before a disastrous stage 19 in which his legs just couldn’t match the pace. Could it be that cycling-loving Britain can’t quite relate to Froome, who was born in Kenya, grew up in Kenya and South Africa, and now lives in Monaco? Do we feel as though Froome is not a ‘real’ Brit, like other cyclists such as Sir Bradley Wiggins? Wiggins raises an interesting point. The former team-mate of Froome has been given far more media coverage, far superior public acclaim, and even a knighthood. And while Wiggins is an exceptional rider with one Tour de France and multiple Olympic medals and world records under his belt, Chris Froome has out-achieved him whilst remaining in his shadow. Wiggins brought British road cycling to the international stage, being the first British cyclist to win the most prestigious race in the cycling world- the Tour de France. Froome has won it four times since, and become the first British winner of the Vuelta and Giro too. 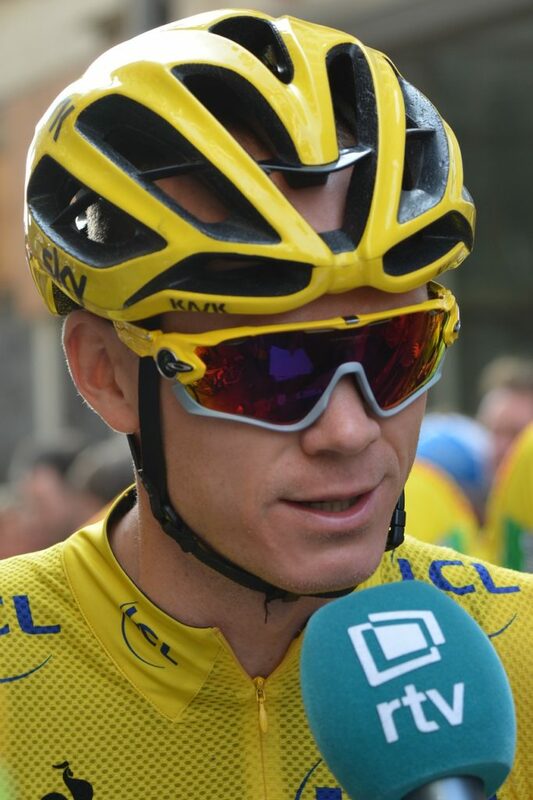 Despite his achievement, starting with the 2012 Tour de France when the super-domestique Froome was eager to leave Wiggins behind on a mountain finish to chase the stage victory for himself, Brits have felt uneasy with Froome. The signals Froome gave Wiggins led many onlookers to assume he was trying to show he was the stronger of the two and his arrogance has not been forgiven. One reason that Wiggo is so loved by Britain is his friendly personality, one that hasn’t been seen in the media for Froome. Wiggins is a very likeable, normal, and interesting character whilst Froome lacks the charisma that Wiggins seems to have in abundance. Both men have had their fair share of accusations, as expected of remarkable athletes in the wake of Lance Armstrong’s cheating. A mystery package for Wiggins and a high drug reading for Froome both came during Grand Tours, yet seem to have tarnished Froome’s Vuelta and Giro campaigns significantly more than Wiggo’s Tour in 2012. Froome even had a cup of urine thrown in his face while riding. Perhaps it is too much to ask that such a driven, focused man should be a people-pleaser too. It is understandable why some warm to Wiggins more than Froome, but this cannot be the reason that Froome is so unrecognised and disliked. He is the centre of attention of the new Team Sky, who have dominated the cycling world recently, with big money availability. It is perceivable that this dominance is resented, with many feeling aggrieved, and this is why Froome is so begrudged. It is a great shame that Froome is not more widely praised. As a sportsman, he is exceptional, unparalleled, and seemingly invincible. He is a hard-worker and a winner. Maybe this Giro d’Italia win will change his fate, but it could just as easily have the opposite effect. But we will have to wait and see if he will go down as one of the greats of the cycling world, despite his personal unpopularity.